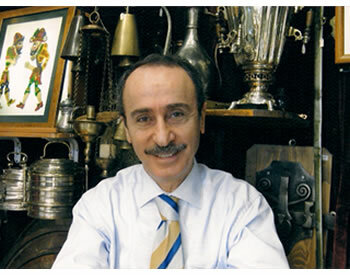 With more than 50 years of experience in the market, Murat Bilir is well- known and respected by fellow traders and customers alike. He has established an enviable reputation in the area of metalwork, and willingly shares his knowledge with all who visit him. The treasure-filled cave over which he presides is filled with “Cultural objects” from the shiniest Czar-era Russian samovars to copper water-pitchers, plates, trays and bowls worn by years of use.